Determined to turn over a new leaf as the calendar begins a new year, Izzie begins the arduous (and soon to be quite familiar) process of getting over Alex. 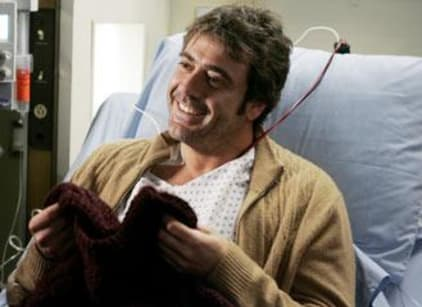 When she meets Denny Duquette, a patient who's awaiting a heart transplant, the chemistry is palpable. The two share a bond that was always missing between Izzie and Alex. Unfortunately for Denny, his donor heart was not able to be harvested by Drs. Burke & Bailey, so he left. But for how long? Meanwhile, George gains a little perspective by treating Bex, a young, troubled teen who Addison determines is hermaphrodite. Despite the wishes of her parents, George tells Bex the situation and helps her adjust to this incredibly difficult news. Being a different kind of guy who struggles to fit in himself, Dr. O'Malley finds he can relate to the young girl a lot more than he would have guessed. Cristina accompanies Miranda to Idaho to obtain Denny's new heart, and while that endeavor is not ultimately successful, she gets a little perspective herself from the pregnant resident. At the end of the episode, she finally opens up to Burke about the baby, and what she planned to do had she not miscarried. At the same time, Meredith mopes about Derek, whose hair is in far better shape than his marriage to Addison. She really hates living in the trailer... and the fact that he is still into Meredith. But she agrees to ride it out. Richard, meanwhile, visits Dr. Ellis Grey in the home she's staying in, and recommends to Meredith that she begin a new program for Alzheimer's patients.